I LOVEEEEEEEEEEEEEEEEEEEEEEEEEE PAYLESS warehouse sale...I have never ever ever felt bored whenever I go there & I never came back empty handed.. :) This morning I picked up Izza & went there.Moja was supposed to go too but he had a meeting with Datin(too bad!!lolsss). Today was the first day of the warehouse sale at The Summit USJ & it'll end on Sunday & I know about the sale because I'm on the mailing list of Payless & they send me a direct email if there's any warehouse sale.I was so thrilled that their latest venue is at Summit because it's nearby compared to before this,they did it at Ampang(they have many venues & I've been to the one at 3K Inn,twice & at the hall near A&W USJ,once). I haven't been to Payless warehouse sale at all this year,so I was really hoping to get some great books.I thought that I would just spend rm50 but instead I doubled the amount because the selection was just EXCEPTIONAL!!! !Izza has got to be the best book warehouse sale companion ever!!hehe. The reason is because we arrived at the place at 11 something & by the time we paid & went to eat,it was 2.15 pm...LOLSSSSS.Izza was like.."Omg,we are such losers! "..hahaha.Translation,we're such bookworms laa. Whenever I go with my family to any book warehouse sale,they don't have the patience to pore over books for hours and hours like I do & plus my brothers doesn't share my bookworm trait,although my parents do buy books too..they don't sift through ALL sections at a book warehouse sale like I do(hey,if you don't you'll miss on A LOT of great books!). Izza suddenly came up with the theory that maybe we're still single because we're too absorbed with books & that because we are very into our many interests,having a boyfriend never really became a priority.Izza was like.."I don't want to be married to my books".I told her that we've to find guys who are absorbed with us because we're self-absorbed...LOLSSS. 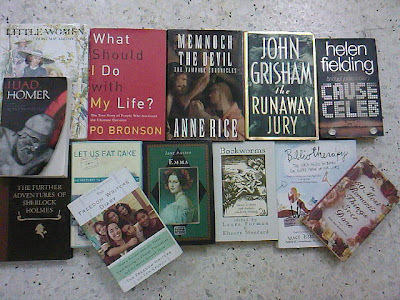 My total of books was 13 books for rm100.Izza bought 13 books too for rm83 something.Izza's was cheaper than mine because my books are all thicker.haha.Actually,both of us wished that we could buy so much more..I had to put aside some books that I picked..Arrghh!! !I wanted to spend more but I didn't want to finish all of my money yet...haha.Maybe tomorrow I'll ask my parents to bring me so that I can get more books at their expense instead???hehehe. -The first book is like..duh..a no brainer!The book has been turned into a movie after all.The 2nd book is by the author of the famous Bridget Jones Diary.The3rd book..is from the queen of vampire,Anne Rice & can't wait to read more about the vampire Lestat..oooh! *The 1st book is of course,the one that has been turned into the famous movie starring Hillary Swank & which my batch had to watch for our CM course last semester.The 2nd book is of course the famous epic poem about the Trojan war.I didn't found the sequel,The Odyssey during the sale though.Damn!Can't wait to read it!! The 3rd book is great because I love having more reasons to buy book & I flipped through the book & the categories was very funny..i.e:When You're Wallowing in a Sullen Perennial Adolescence:Coming-of-Age Books.LOLSSS.The 4th book is self-explanatory.It's great reading about other bookworms & how they come about being passionate about reading & writing. The first book I bought because I love Sherlock Holmes & have you seen the trailer of the movie?? ?Super cool!Robert Downey Jr. plays Sherlock & Watson is played by Jude Law.Can't wait to watch it. The 2nd book is like..duh!I love cooking & reading about food...:).The 3rd book is a childhood fave & although I've a paperback version,this one is in hardcover with beautiful illustration & I just had to have it.The 4th book is great because sometimes I feel like the title & it's great reading about many other's successful story in life. The 5th book was found by Izza & coincidentally we were talking about how chivalry is dead among guys & the book is about great romantic gestures made by famous couples--Grace Kelly & Prince Ranier,Carole Lombard & Clark Gable,King Edward & Mrs.Simpson,Mumtaz Mahal & Shah Jahan,Humphrey Bogart & Lauren Bacall & many more. The 6th book is a no brainer since I collect Jane Austen book & Izza found the book for me.Phew..that's all the books that I got for today.Can't wait to wrap(in PVC embossed cover only please!I only use that plastic wrap for my books.) & read all of them.Bye!! Kalau ko pegi lagi, beli satu Iliad dekat aku! i didn't saw another copy of the iliad though..hehe..rileks la.
" Izza suddenly came up with the theory that maybe we're still single because we're too absorbed with books & that because we are very into our many interests,having a boyfriend never really became a priority.Izza was like.."I don't want to be married to my books".I told her that we've to find guys who are absorbed with us because we're self-absorbed...LOLSSS." wahahahahah. omg. we are severe losers la. ngahaha. yeah, we have yet to prove the hypotheses wrong :D find one now!! LOL!! !